We recently received an email from Kellie Kvasnikoff, a commercial fisherman forced into a career change by the 1989 Exxon Valdez oil spill, who is now Chief Information Technology Officer for the Snoqualmie Indian Tribe. 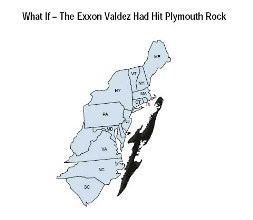 In 2006 Kvasnikoff published Exxon Valdez 18 Years and Counting detailing the fight to get justice from Exxon after the economic, environmental and cultural disaster that the oil spill brought to Prince William Sound. Now, following up on the Supreme Court decision to let the oil giant wriggle off the hook on punitive damages, an on-line petition asks that Congress open an investigation into Exxon and the court's decision. You can read and sign here.